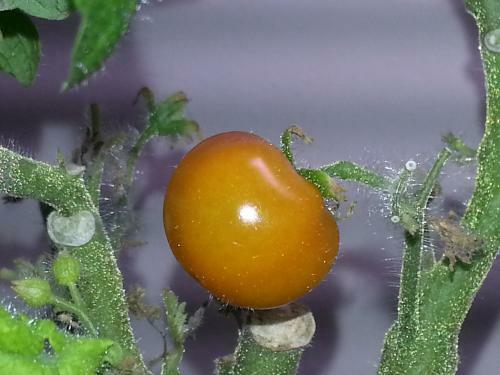 So the tomato had finally changed color except I'm not sure whether it's ripe yet as I have never grown tomatoes before. I may post in the forums to find out for sure. My reason for asking is because this first tomato is for my mom. She's 74, doesn't have all her teeth and can't chew tough things, so it's important for me to know whether this is soft enough for her to eat. Aside from this, in growing news, I am getting another Aerogarden. I saw the advertisements for the new Aerogarden Bounty and knew I had to have one. In addition to the Aerogarden, I'm getting a metal rolling cart that's big enough to accommodate both Aerogardens once they're put in place but small enough for my short self to have access to everything. Aside from this, I am doing NaNoWriMo and I have a bad cold.